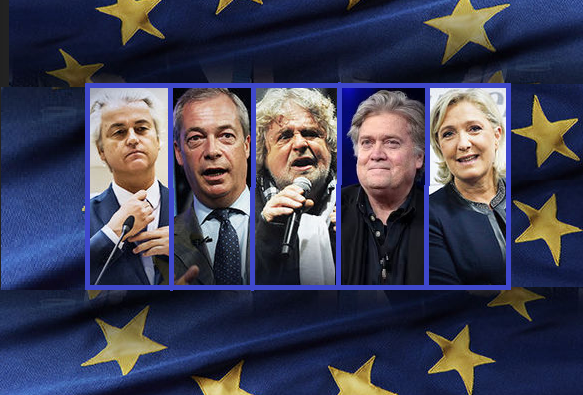 The work done by former White House chief strategist Mr. Steve Bannon seems to have paid off for Eurosceptic parties as the latest polls indicate they could be looking at a swoop in next year’s European elections. Mr Bannon, who’s held meetings with the leaders of France’s National Front, Germany’s AfD, Italy’s Lega Nord and the Five-Star-Movement and the UK’s UKIP earlier this year, wants to counter the influence of Mr George Soros on the European continent by grouping together a rightwing alternative to Mr Soros’s Open Society Foundation (an NGO that has given away some $32bn to largely liberal causes ever since its creation in, of all years, 1984). There are however some smaller political parties that do not share all of Mr. Bannon’s views. His moral view of capitalism as a vehicle for Judeo-Christian values did not bode well for the Danish People’s party and his US-centric foreign policy vision will tick off some near the Mediterranean. Related coverage: <a href="https://thegoldwater.com/news/26913-Steve-Bannon-I-Do-Not-Think-Mueller-Should-Be-Fired-Video"> Bannon Does Not Think Mueller Should Be Fired</a>. A Reuters poll indicated however that enthusiasm on the right is great to go out and vote in May 2019 for European elections. At the moment, if polls hold where they are at, Eurosceptic parties are set to expand their strength in the European Parliament by over 60 percent. Related coverage: <a href="https://thegoldwater.com/news/31149-Steve-Bannon-Trump-Feels-Misled-Over-Brexit-Video">Steve Bannon Says Trump Feels Misled Over Brexit</a>. In other words, the despots are going to rig the elections to keep populist parties OUT? Sounds like it.